There is an even higher risk if your forklifts are going in and out of your warehouse regularly. The wheels carry a lot of dirt and water from outside, especially if it’s raining. Waterhog Forklift Mats are said to prevent slip hazards, as well as keep warehouse environments safe and clean. 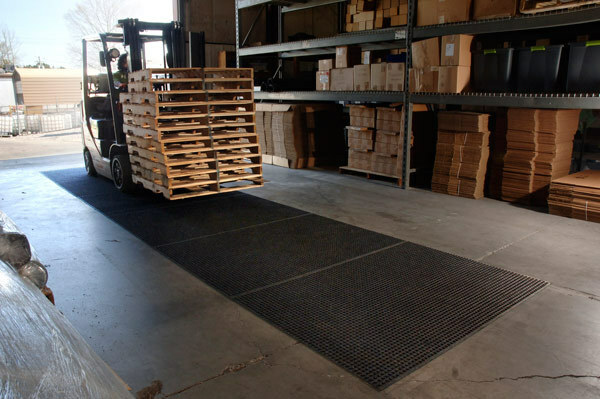 These mats are designed for forklift entrances, such as loading bays. To ensure safety and protection, the mats scrape and wipe away dirt and moisture from the wheels. This can also prevent the forklifts from skidding. The Waterhog Forklift Mats are 100% crush-proof and bi-level constructed. This enables the mat to endure the weight of a loaded forklift. In addition, this allows the mat to hold onto dirt and water, which can be easily cleaned. The mats takes less than an hour to install with strong, industrial double-sided tape.